St Juan Diego Cuauhtlatoatzin (1474-1548). Little is known about the life of Juan Diego before his conversion, but tradition and archaelogical and iconographical sources, along with the most important and oldest indigenous document on the event of Guadalupe, "El Nican Mopohua" (written in Náhuatl with Latin characters, 1556, by the Indigenous writer Antonio Valeriano), give some information on the life of the saint and the apparitions. When he was 50 years old he was baptized by a Franciscan priest, Fr Peter da Gand, one of the first Franciscan missionaries. On 9 December 1531, when Juan Diego was on his way to morning Mass, the Blessed Mother appeared to him on Tepeyac Hill, the outskirts of what is now Mexico City. She asked him to go to the Bishop and to request in her name that a shrine be built at Tepeyac, where she promised to pour out her grace upon those who invoked her. The Bishop, who did not believe Juan Diego, asked for a sign to prove that the apparition was true. On 12 December, Juan Diego returned to Tepeyac. Here, the Blessed Mother told him to climb the hill and to pick the flowers that he would find in bloom. He obeyed, and although it was winter time, he found roses flowering. He gathered the flowers and took them to Our Lady who carefully placed them in his mantle and told him to take them to the Bishop as "proof". When he opened his mantle, the flowers fell on the ground and there remained impressed, in place of the flowers, an image of the Blessed Mother, the apparition at Tepeyac. 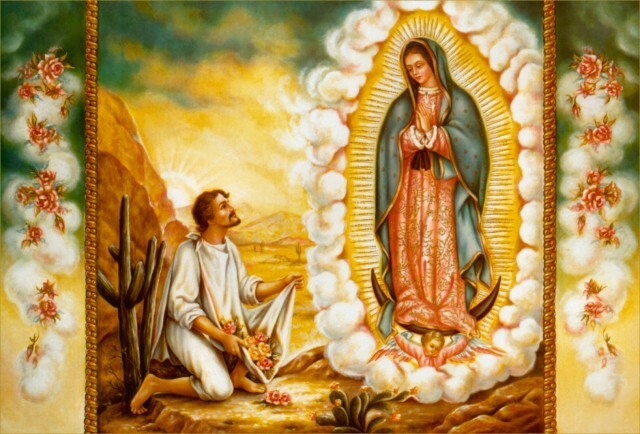 Much deeper than the "exterior grace" of having been "chosen" as Our Lady's "messenger", Juan Diego received the grace of interior enlightenment and from that moment, he began a life dedicated to prayer and the practice of virtue and boundless love of God and neighbour. He died in 1548 and was buried in the first chapel dedicated to the Virgin of Guadalupe. He was beatified on 6 May 1990 by Pope John Paul II in the Basilica of Santa Maria di Guadalupe, Mexico City. The miraculous image, which is preserved in the Basilica of Our Lady of Guadalupe, shows a woman with native features and dress. She is supported by an angel whose wings are reminiscent of one of the major gods of the traditional religion of that area. The moon is beneath her feet and her blue mantle is covered with gold stars. The black girdle about her waist signifies that she is pregnant. Thus, the image graphically depicts the fact that Christ is to be "born" again among the peoples of the New World, and is a message as relevant to the "New World" today as it was during the lifetime of Juan Diego.